Looking for an existing site? Why create an InMemori site. InMemori is a free service that helps you bring together friends and family to receive their messages of condolence, remembrances and photos. From an free, private, online site, you can inform your family and friends about the passing of your loved one and easily share details about the funeral service by email or text. Each person that receives the link to your lnMemori site can post a message of condolence, a remembrance or a photo. Receive a beautiful book containing all the words and photos shared on the site in tribute to your loved one. Dear InMemori, Thanks to you, my brother has remained in our memories and there is a site just for him that everyone can go on. When someone leaves us, it is hard to express just who he was and that is why I find InMemori so wonderful: anyone and everyone, near or far, can say something, share a memory, a picture or a thought. Thank you very much. The InMemori website is outstanding. It relieves families of logistics that are hard to manage in such a painful time. The site is understated and clear. The messages and photos posted are a beautiful tribute to the departed and are a way for families to receive supportive thoughts and prayers. A wonderful endeavor. Well done! I would like to thank you with all my heart for your wonderful service. Because of you, it was quite easy to share our sad news with people we know all over the globe. In addition, the messages of condolences, remembrances and photos of my dear husband were a source of comfort during that period of deep mourning. InMemori sites are private and never appear in search engine results. InMemori offers families a handsome, understated site, void of “likes” and advertising. InMemori is free of charge and intended for all ages, cultures and beliefs. 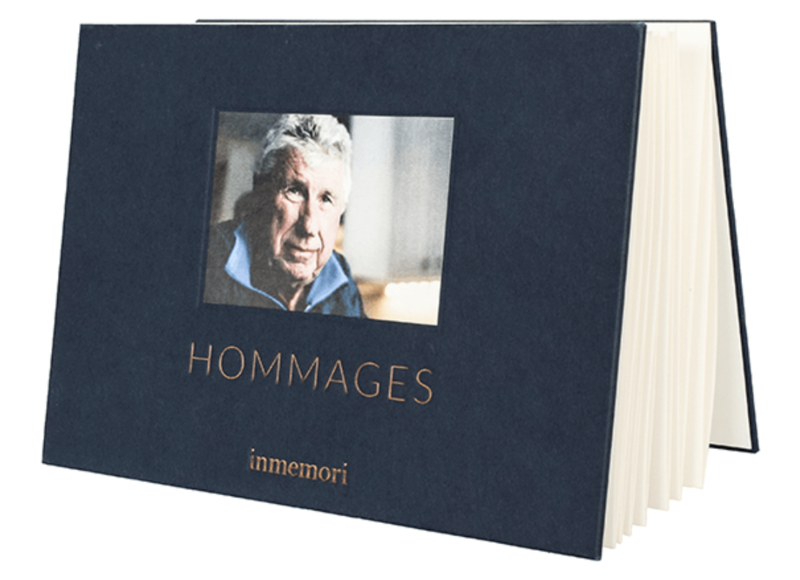 The InMemori book is a beautiful keepsake of all the messages and photos shared by your family and friends. Fabricated by a traditional printshop in the South of France, with the actual layout done by InMemori staff, so you don’t have to spend hours doing it yourself.